Mostly I love, love quilting, for all the opportunity it provides for playing with color and pattern and texture. I love precise geometry and I love wild improvised patchworks, and I really, really love the texture achieved through hand quilting. I love it all. I created and sell Snowflakes Freezer Paper Shapes for English Paper Piecing and Applique. I love those two techniques; ask me anything about them and I’m happy to talk! 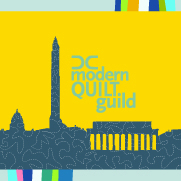 I’m a past president of the Washington, DC Modern Quilt Guild and I currently teach handwork classes at Stitch Your Art Out in Pine Grove Mills, PA.
My dream is to own a piece of land where my children can explore a little wilderness, and where we can raise chickens and pigs and plant fruit trees and raspberries… and until that becomes a reality for us, I make it a point to drive through the countryside whenever possible, scouting out derelict old places that I can fantasize about restoring and just soaking up the view. Thanks for stopping by my little corner of the internet, and thanks to all the inspiring quilters/bloggers/friends I’ve connected with through this lovely hobby of ours! Hello from Florida! I LOVE your fabrics! Congratulations on your new fabric line!! It’s beautiful! I am a volunteer for Conkerr Cancer Tampa Bay and we are in dire need of fabric donations…- did I say dire? I meant D I R E!! We distribute sewn pillow cases to eight surrounding childrens hospitals and our chapter alone gives out 1300 pillow cases per month!! (1300 x $5 = $6500) We have a great network of volunteers to sew and they do their best to support us financially, but we are always in need of fabric. We averaged the cost to about $5 for materials alone. Our volunteers bring their own equipment and thread and sew thousands!! I realize you or your company may support other organizations (Miles of Smiles, etc.) but even a small donation thrown our way is appreciated! It requires about 1/3 yard for the border of the case and 3/4 yard for the body of the case…remnants? seconds? We are willing to work with any donation! My mother is 90 years old and two years ago was diagnosed with lung and breast cancer; she survived both and even drove herself to radiation everyday for weeks! Even she pulls up her bench and sews at her local shop from 9am-8pm – because she knows what a difference a good attitude makes! She amazes me each day! Please consider shipping us some fabric to sew pillowcases for kids with cancer (and other long term illnesses)? It’s a worthy cause and makes a stupendous difference!! We need 100% cotton (no flannel please) and fun prints would be the most appreciated! We will take leftovers, last years line, samples, remnants as well as full bolts!! No donation will be refused!! !